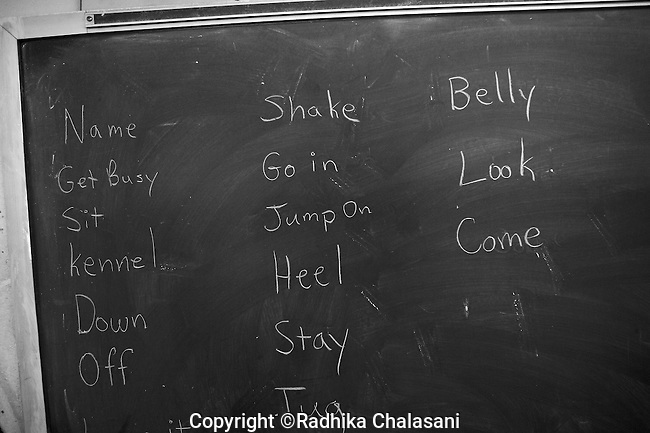 BEACON, NEW YORK: A list of commands prisoners are expected to teach their puppies are written on a chalkboard in the Puppies Behind Bars classroom at Fishkill Correctional Facility. The dogs must learn 80 commands during their training period at the prison. The program works with prison inmates in New York, New Jersey, and Connecticut to train both explosive detection dogs and service dogs, including ones who help injured soldiers or those suffering from post traumatic stress. Fishkill Correctional Facility is a medium security prison in New York with 22 men in the puppy program.